For additional information about this book, visit the website HowardBressler.com. 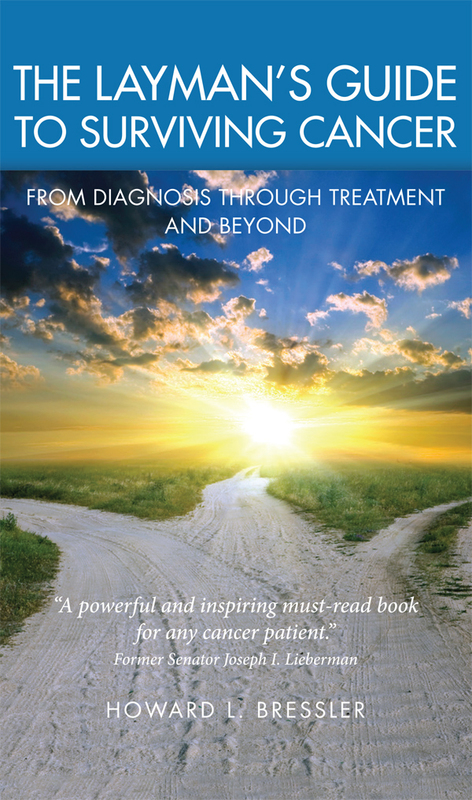 "The combination of personal anecdotes, practical guidance and realistic encouragement Howad Bressler provides in The Layman's Guide To Surviving Cancer has resulted in a powerful and inspiring must-read book for any cancer patient and their loved ones navigating through the cancer experience. I highly recommend it." The Layman's Guide To Surviving Cancer is a raodmap for going through and surviving the cancer ordeal from diagnosis through treatment and life after cancer (or the preparation for the end of life). It approaches these issues from a physical, emotional, dietary, holistic, and spiritual perspective. It draws on my experiences as a leukemia patient and survivor, my interactions with and counseling of other patients and my career as a toxic tort lawyer and skills in breaking down complex issues in laymans terms (much as I would do for a lay jury). The book has received strong endorsements from oncologists associated with Memorial Sloan-Kettering Cancer Center and Columbia University, one of the leading pediatric oncologists in the country, the author of Everyone's Guide to Cancer Therapy and several cancer patients, among others. The book addresses many of the issues that cancer patients face, such as: how to choose a doctor/hospital; where to get information about your disease and treatment options; how to deal with the emotional roller-coaster that a cancer diagnosis can evoke; the roles that diet, stress, nutrition and attitude play in defeating cancer; nutritional and other complementary approaches for dealing with cancer; how to prepare practically for the demands that treatment will put on your life routines and maintain your sense of normalcy as much as possible; your rights as a patients (both with regard to your medical treatment and workplace); and how to take away the positives that can come from the cancer experience. The Layman's Guide To Surviving Cancer has been described as an "easy-to-read, engaging, commonsense guide for the newly diagnosed cancer patient and those undergoing treatment," and a book that "should and will become 'The Bible' for patients who have been diagnosed with cancer." Howard Bressler has been married to his wife, Ceci, for twenty-two years. They have two daughters and live on Long Island, New York. Howard has been practicing law in New York City for more than twenty years, and has extensive experience in toxic tort and chemical exposure cases. Part of that work has involved investigating the science behind diseases, including cancer, and working with expert scientific witnesses in order to make complicated issues regarding disease causation and progression understandable to lay-people. In August 2000, Howard was diagnosed with acute promyelocytic leukemia. He underwent high-dose chemotherapy and participated in a clinical trial using arsenic trioxide to treat his cancer. In The Layman's Guide To Surviving Cancer, he puts his analytical skills, perspectives and personal and professional experience to work in crafting a roadmap for others to follow as they navigate the road to cancer survivorship. Visit him online at HowardBressler.com.